The Supreme Court has reserved its judgment on an application by two objectors to Apple's proposed data centre in Athenry. They had asked the court for permission to bring an appeal against a High Court decision allowing the development to proceed. The court heard legal arguments from all sides involved in the case this morning, which relates to Apple's proposal to build an €850 million data centre on a site at Derrydonnell woods outside the Co Galway town. Lawyers representing objectors Allan Daly and Sinead Fitzpatrick told the court that their proposed appeal is based on the argument that An Bord Pleanála only carried out an environmental impact assessment of part of the proposed development. 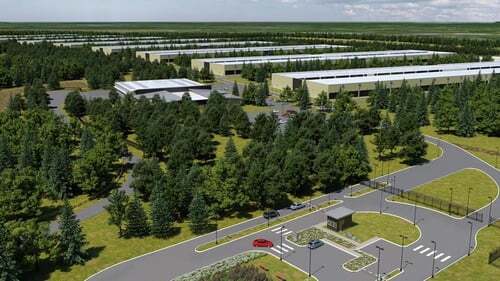 Apple sought and received planning permission to build a single data hall and an electricity grid connection at the site. But Oisin Collins JC for Mr Daly and Ms Fitzpatrick said that the single data hall is part of a wider master plan that would eventually involve the construction of up to eight in total. He said the entire development would require 6-8% of all the electricity available from the national grid when operating at full capacity and the grid connection, which would cover 20 acres, is capable of powering the whole development. Yet, he said, even though it sought further information on the energy requirements of the masterplan, An Bord Pleanála did not carry out an Environmental Impact Assessment (EIA) of it. He said his clients argue that the board was required to do so by law but did not and no reason was given as to why not. European law says that when assessing a development such as this one for its environmental impact, he claimed, the assessment has to be done on the basis of the entire development being built. He said there is no assessment anywhere of the increased power needs of the development, what infrastructure would be need to provide it or how the energy would be supplied. Data centres are being built across the country in very large numbers, he said, and the courts would be confronted with these issues again and again if the matter was not determined. But counsel for An Bord Pleanála, Nuala Butler SC, said she was not significantly wiser as to what is the net legal reason behind the proposed appeal was. She said the board has granted permission for one hall and a 220MW grid connection, but the single hall would only use 30MW of that. She said her client had not done a full EIA of the entire masterplan as it was not proposed nor was Apple seeking planning permission for it. If Apple does come back looking for permission for the other seven halls, then the board will have to assess it then. She said that build out, if it were to happen, could take until the 2030s and therefore there was no need for an assessment to be done now. The board's position, she said, was that it had met all the European rules and had done a full EIA of the development being sought. Counsel for Apple, Rory Mulcahy SC, said the High Court had refused permission for an appeal to the Court of Appeal because there was no uncertainty in the law. He said all the appellants can argue is that the application of the law in these particular set of circumstances is wrong, but that does not meet the requirements for a Supreme Court appeal. After hearing the submissions, the three-judge division of the Supreme Court said it would give its decision in the case in due course. Last October, the High Court cleared the way for the €850 million centre to go ahead, dismissing a judicial review taken by Mr Daly and Ms Fitzpatrick of An Bord Pleanala's decision granting it planning permission. The following month, the High Court refused to give the objectors permission to appeal its decision to the Court of Appeal. That meant the only remaining avenue for appeal was directly to the Supreme Court and in December the objectors lodged an application asking the court to admit its case for full hearing. If the court does admit it, the case will go to full hearing, a process that will take several more months. Construction of the first phase promised to generate 300 temporary jobs, with up to 150 permanent staff required to run it. Following oral hearings the planning authority confirmed the permission in August of last year. Amid the delays, Apple has remained tight-lipped about whether or not it still intends to proceed with the data centre.